Getting the powers of every fairytale princess ever sounds like it’d be great, right? Perfect pitch, detecting beans under untold layers of bedding. But how do you use those powers to help save your missing brother? That’s the question at the heart of Mega Princess—the new creator-owned fantasy comic from Boom Studios. Written by Kelly Thompson, and with art from Brianne Drouhard and M. Victoria Robado, Mega Princess follows the story of Maxine, a young princess reluctant to take on the role of being a ladylike head of state who gets granted the power of every princess ever on her birthday. After a spate of licensed hits like Jem for IDW, Power Rangers: Pink for Boom, or A-Force and the upcoming Kate Bishop Hawkeye series at Marvel, Mega Princess also marks a change of pace for the writer, as her first creator-owned monthly series. 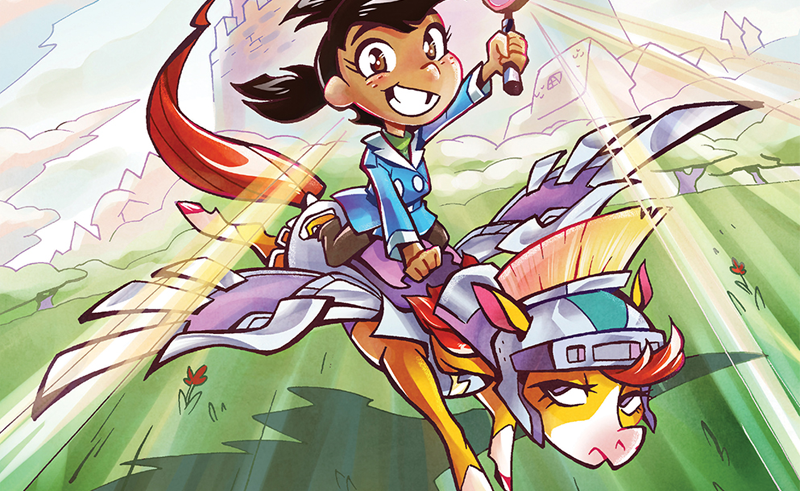 The first issue of Mega Princess—in a series of five—hits shelves tomorrow, November 9th.